Journalists in Kogi were thrown into mourning as they lost a colleague, Abdullahi Ibrahim, who was a reporter with the African Independent Television. The late Abdullahi, a senior journalist, was said to be going to his hometown, Okaba, in Ankpa Local Government Area of the state on Thursday when he had an auto accident. 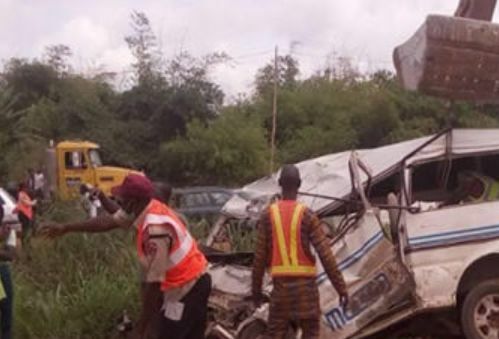 He had earlier visited the press centre to invite colleagues to his daughter’s wedding coming up in December and was on his way back to his base in Ankpa when the accident occurred between Ojodu and Ochadamu communities along the Ajaokuta-Ayingba highway. He was said to be travelling in his Peugeot 504 saloon car with three of his children and his pregnant wife when the accident occurred. According to an eyewitness, Abdullahi’s car was involved in a head-on collision while trying to negotiate a bend. A Toyota Hiace belonging to a popular transport company was also trying to overtake him on a top speed which led to a collision with an oncoming vehicle. He was said to have died instantly with his three children and the wife who was said to be five months’ pregnant. His wife and children were seen at the press centre where he bought snacks and drinks for them before going for the repairs of the car in preparation for the journey. Abdullahi, described as a crack reporter, had worked with several newspapers including the Sentinel, National Mirror, Royal Time and at a point was a publisher of the Trumpet before joining the AIT.